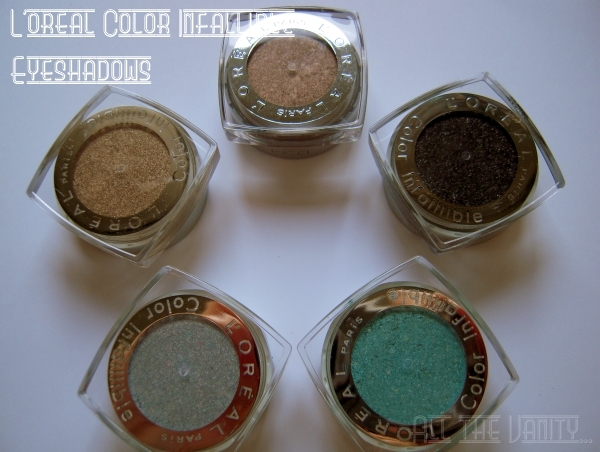 Yes, I do realize that this is probably one of the cheesiest titles ever written in the blogosphere, but it's not far from the truth: You see, I may have developed a little crush on theL'oreal Color Infallible eyeshadows! Now, I know that most of you are probably familiar with them already, but with their ever increasing color range, I thought it couldn't hurt sharing my thoughts with you. The principle behind this range is a long-lasting eyeshadow with a cream-to-powder finish. Now, these are not exactly creams or loose eyeshadows either, in fact when they're new and freshly bought, they lean more towards a cream (though not in the traditional way, think more Chanel Illusion D' Ombre), but, as I've seen happen on testers, it is possible for them to reach the loose pigment state as they progressively get drier. Not that it matters that much, since that beautiful metallic result remains the same either way. - Bronzed Taupe. 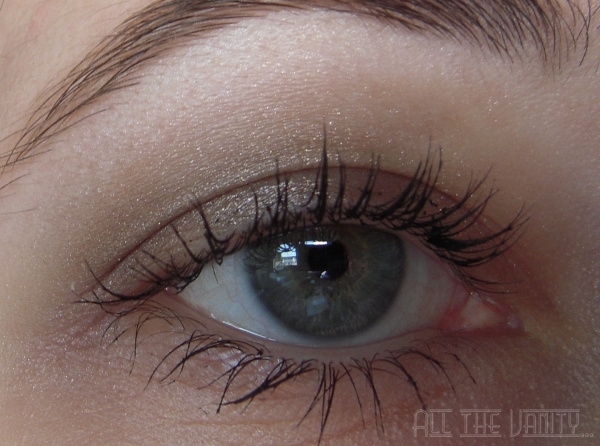 The name provides an accurate description of that lovely metallic shade, which also has a more neutral undetone. The sheen it gives, however, changes depending on the light. On my swatch, it looks more silver toned, but in real life it can look gold or even rose gold at times. Definitely one of the best sellers of the range. - Eternal Black. Not unique because of its pigmentation (it's only a charcoal shade in that aspect), but because of the pretty silver sparkle its infused with and which doesn't fade with the blending. A great one for nighttime. - Sassy Marshmallow. Now this is one of the most recent shades and it's a light, silvery periwinkle blue shade. Upon close inspection one can see the teal as well as the pink shimmer it contains, which add some warmth and dimension. I love this as an inner corner type of shade. - Innocent Turquoise. Again, one of the most recent releases and another one with that dual shimmer. The shade is a light turquoise with a silvery aqua sheen, but, as far as this one goes, I must admit I haven't tried it extensively except as an accent of colour on my lower lashine - I think this shade is mostly suited for the brunettes out there. You can see how perfectly they blend with each other and the subtle sheen they give off. Obviously, if you're looking for a more dramatic effect, you can apply these wet for a bigger impact. Performance-wise, I was extremely impressed: I tested these in the middle of a 40C heatwave without a primer and they didn't slide off - I just noticed some minimal creasing after a few hours, which given my hooded lids, was to be expected. With a primer these will remain intact up until you're ready to take your makeup off. Definitely one of the must-have drugstore products out there. Disclaimer: Sassy Marshmellow and Innocent Turquoise have been provided for review consideration by the PR representative of the brand. Have you tried any of the Infallible shades yet, and if so, which one is your favourite? Recommendations on which shade to pick next (I'm thinking Gleaming Bronze)? The eye makeup look you did is just gorgeous! I know what you mean about bronzey-gold eyeshadows turing to orange when worn on the eyes (aka "the Woodwinked effect"); the only one I've found that works for me is the Celebrity mineral shade by Elf. I'm guessing Sahara Treasure must be similar to that, nevertheless I'd love to try it out as well! @greek gal: Well, I'm not surprised, but if you try another Hondos, you might get luckier! I also believe they restock these fairly often! Me too! 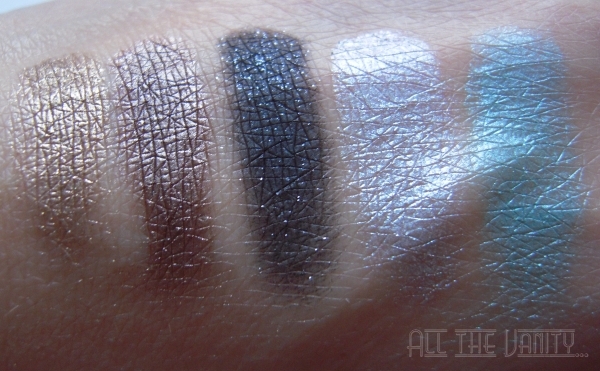 Love the turquoise/silver colours, haven't bought the brown shades, but they have a lovely shimmer! Bronze taupe looks amazing! And I love the way you used the eyeshadows, it's so subtle but there at the same time. Sahara Treasure and Bronzed Taupe look amazing! I have never looked into these eyeshadows at the drugstore, next time I am before a L'Oréal shelf I will definitely check those two out! @Blusherine: Oh no, do check them out when you get the chance, they're lovely eyeshadows and the colour range is pretty impressive! Πραγματικά, το αποτέλεσμα είναι τέλειο!